Franklin Roosevelt famously warned America that “the only thing we have to fear is fear itself.” Spoken during the worst of the Great Depression, these words, uttered by a powerful politician, were amazingly silly. Did the people of Oklahoma not have to fear all of their topsoil blowing away to the east? Did people not have fear crime? Was starvation not a genuine object of fear? While Roosevelt’s line might have sounded good coming through the radio, it really didn’t have much substance to it, at least not as he intended it. What student of the Bible has not encountered Proverbs 9:10, which admonishes us that “The fear of the Lord is the beginning of wisdom.” Apparently, FDR never read that. Let’s consider the fear of fear versus the fear of God for a moment. That long-ago president urged us to essentially fear nothing. We didn’t need to fear death, disease, war, starvation, crime, poverty, ignorance, violence, racism, unemployment, or any of a hundred other significant things. Proverbs tells us essentially the same thing, except that we are to fear God. 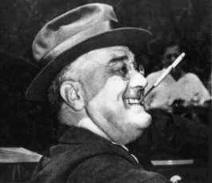 FDR replaced the fear of fear with a can-do attitude and clever government programs. Proverbs replaces the fear of God with nothing. Nothing can replace it. FDR sought to banish fear; Proverbs seeks to embrace a particular fear. The fear of the Lord endures forever, our verse today asserts. What other fear lasts forever? Pain is temporary. Unemployment ends. The Great Depression and the Dustbowl ended. World War II, not even on Roosevelt’s radar at this point, ended. Even death, through our hope in Christ, ends. Of all the objects of fear, only God remains as such forever. The only thing we have to fear is God Himself. What if Roosevelt had spoken those words? What difference would it have made? A proper fear of God looks to God for all of its answers, all of its protection and provision. The absurd fear of fear looks to human efforts for all of its answers. Those other fears, temporary as they are, can be considered impure, while the fear of God is pure. We don’t have fear fear itself. We should fear the lack of fear in the God who created us.